There are few things that can organize your life more than a good file cabinet, but if the appearance of an old-school metal file cabinet is turning you off, consider one that looks like a piece of furniture instead. There are some great options in office furniture that will straighten out your personal or work files and look good in your home at the same time. In fact, if you don’t even have a home office - no problem. These wooden cabinets will work in nearly any room in the house. 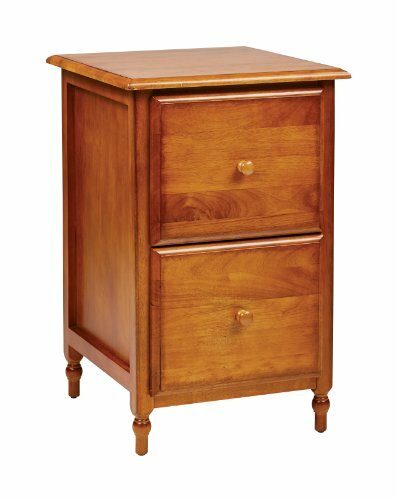 If a small and attractive file cabinet is all you are looking for, the classy look of the Knob Hill Collection from Home Star includes an antique cherry finish in a solid wood cabinet that is built to last. With smartly turned legs, wooden handles, and a warm finish, this cabinet looks more like a side table or nightstand than a piece of office furniture. It will fit in nicely next to a bed or chair, or in any little nook around the house. Both of the drawers slide on metal tracks and have built-in hanging rails on all four sides. The unit has two drawers that will support either letter or legal files. Best of all, this is real solid wood, so it will hold up over a long period of time. One thing that makes a standard file cabinet look so uncomfortable is the bland monotone appearance or commercial-looking handles that they always seem to come with. The Bush Furniture Stanford Collection 2 drawer unit solves this problem completely with an attractive cherry surface on top of a rich black cabinet. The resulting look is warm and stylish. In addition, the brushed metal handles offer a nice modern touch and the legs and curved-cut side panels lift it off the floor much like a standard side table. The drawers will accommodate legal, letter, or A4 files. The drawers are interlocking, so you won't have to worry about the cabinet tipping over. If you don't have an office but need office storage that won't deteriorate the look of your living space, this piece of furniture will fit in nearly anywhere. If you are seeking a bright piece of furniture to hold some files, the antique white Harbor View cabinet from Sauder is a fine choice. It’s a small cabinet with one drawer, but also includes versatile built-in storage for other office documents, printer paper, or other supplies. 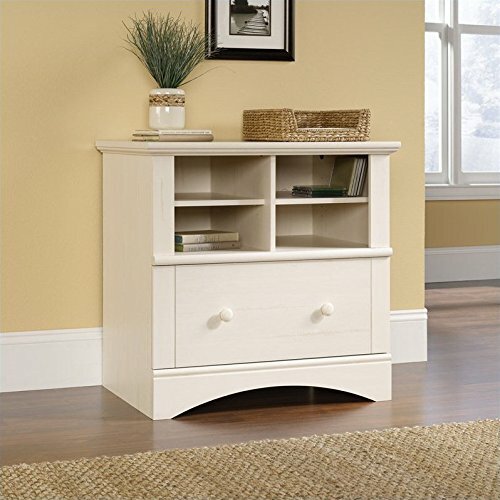 Style-enhancing touches include a curved wood baseboard along the front, white wooden handles, and a routed top shelf edge which really makes this feel like furniture. The file drawer has a lock and key for some added security, and will hold letter, legal or European-sized files. This would make a great printer stand, with your documents in the drawer and printer paper in the cubby holes. A white back hides the wall from view through the storage compartments, so a printer or phone cord will stay hidden nicely. For those seeking a small amount of filing space with extra room for storage, the Shoal Creek lateral file by Sauder is a nice choice. The cabinet really does look like a piece of furniture that could be next to a wall in any room, and the rich mocha color is very warm and comfortable. 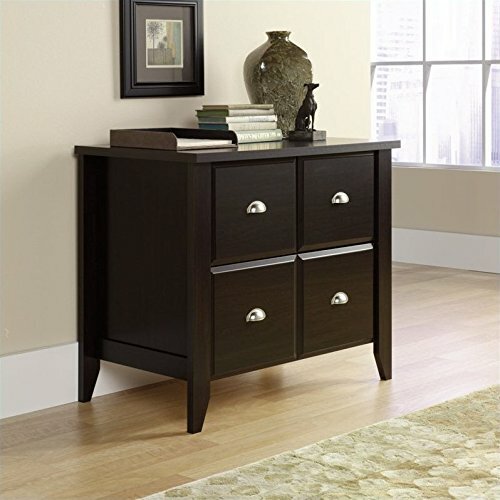 With modern metal handles and tapered legs, it can stand alone in any nook. The square front panels further hide the fact that there are lateral files inside. The bottom drawer holds letter, legal, or European-sized files with full-extension slides.The upper half is actually two cabinet doors that open to reveal a large storage area - perfect for extra office supplies or anything else that you want to store nearby. Whichever cabinet you choose, there is no need to settle for a cheap metal alternative. You can organize your important documents with a piece of wooden furniture instead. Any of these attractive, wooden file cabinets will solve the storage problem while adding style to the room that they are placed in. Hopefully this article has given you at least an idea of what type of file cabinet you want that looks like furniture, plenty more can be found if you look in the right places. Also, if you have concerns, comments or questions regarding either the show case article of file cabinets that look like furniture or any of the cabinets mentioned above -- then please do not hesitate to make them in the comments section just below and we will be sure to get back to you as soon as possible.